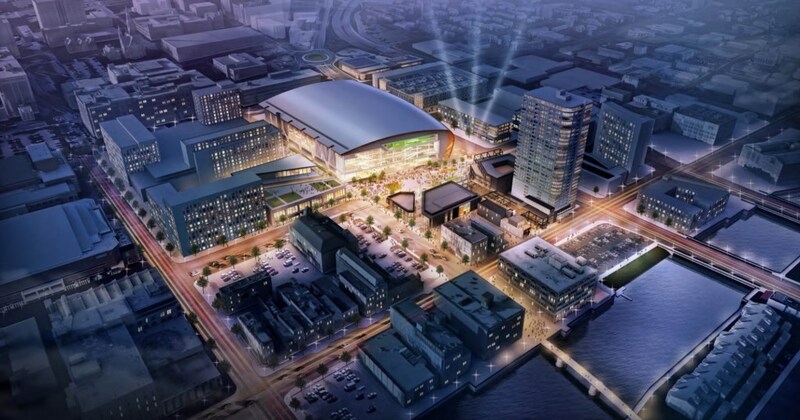 Despite internet message board buzz, the Milwaukee Bucks won’t be playing in Fiserv Arena. The Brookfield-based financial services technology company confirmed Friday morning that the firm isn’t in the running for the naming rights to the Wisconsin Entertainment and Sports Center. Speculation that Fiserv was the finalist for the “imminent” deal had grown when it was discovered that FiservArena.com and FiservCenter.com were both registered in January. Interest was further heightened when commenters started to connect the dots between the Bucks desire for an office tenant in their Deer District development and Fiserv’s search for a new site for their headquarters that has been delayed for months. Bucks co-owner Wes Edens told the media earlier this week that the team is exchanging contracts with the naming rights partner. “It’s a company that’s local. It’s got a national presence.” Early estimates pegged the annual price as high as $10 million, and Edens said the team is happy with the rate they’re getting. Had it been interested, Fiserv certainly has the cash to buy the naming rights. The company reported $1.246 billion in net income in 2017. Fiserv is publicly traded on the NASDAQ stock exchange, with a market cap of $29 billion, and has approximately 24,000 employees spread across the globe, with about 900 working out of their Brookfield headquarters..
Fiserv is evaluating sites in The Corridor in Brookfield, the UW-Milwaukee Innovation Campus in Wauwatosa and the Reed Street Yards in Milwaukee for its corporate headquarters, as well as sites outside of Wisconsin. It previously ruled out a possible site in Schlitz Park. Potential sites outside of Milwaukee include Alpharetta, Georgia where the company has approximately 1,600 employees. CEO Jeffery Yabuki said the search is focused “primarily within the Milwaukee area” at the company’s May 2017 shareholder meeting. An indicator that Fiserv might stay here emerged two months before that: in March Todd Horvath, president of the company’s bank solutions division, purchased a $1.4 million home on N. Lake Dr. in Milwaukee. A company representative declined to provide an update on the search. The state has become involved in attempting to keep Fiserv in Wisconsin. Included in the state’s Foxconn financing package is $10 million in tax credits for Fiserv if it maintains 93 percent of their employees and corporate headquarters in the state. An additional $2.5 million could come from the Wisconsin Economic Development Corporation for capital costs and the selected municipality for the corporate headquarters is likely to contribute additional funds via tax-incremental financing. Plenty of other area firms remain potential naming rights partners for the Bucks, but a number have been crossed off the list. The team has established “founding partnerships” with Johnson Controls, MillerCoors, Froedtert & The Medical College of Wisconsin and BMO Harris Bank, likely eliminating those firms from contention. Bucks president Peter Feigin confirmed it’s not Harley-Davidson, which has their logo on the team’s jerseys. Foxconn is reportedly out of the running. Potawatomi Hotel & Casino, Kohl’s and Northwestern Mutual are out, as is Madison-based American Family Insurance. And while that eliminates a lot of major employers, it still leaves a number of other major names like Kohler, SC Johnson, Milwaukee Tool, Rockwell Automation and Robert W. Baird. My sleeper pick is Leinenkugel. They are doing the big project around the corner at their 10th street brewery. Folks are drinking craft beers at sporting events. Big regional and national presence. Can’t the state ever pass a bill that doesn’t have secondary items attached? Damn, it’s too bad FoxCON can’t trickle even a little bit back of our 4.5 billion Walker and republicans forced us taxpayers to give them. They could’ve recycled the suicide nets they use at their factories and everything! What a shame! @Michael – that’s effectively the same thing as MillerCoors, which is already a founding partner. My personal favorite for possible arena naming rights is Milwaukee Tool. I’d love to see its electrified name and logo on the arena roof and elsewhere. And, I’d love to have the Bucks take all visiting teams “out behind the ‘Tool Shed for a whoopin’. 😉 It’s been recording record revenue and is aiming for $5B in revenue by 2020. And, its a frickin’ tool maker…how quintessential Milwaukee! Why not Manpower? I never hear them mentioned for this, but they’re a huge international company here and it wasn’t that long ago that they made the decision to invest in downtown with their HQ building. There has been continued growth in the temporary staffing sector in this increasingly grotesque form of capitalism we have. Companies like Manpower do well because other companies don’t want to commit to FT/perm employees, especially not early on. They want to outsource the headache, minimize risk, and keep people as contractors as long as possible to avoid offering benefits, etc. Anyway…my understanding is that the company is doing really well. This could be a way for them to make a bold statement and work on becoming the household name associated with the staffing industry. Just a thought. @Paul M. Right? No one ever mentions Manpower. Could be a great name! @midnightson – nice article! Man, there are some odd ball names out there. Makes me cross my fingers that MKE won’t be the next. Milwaukee Tool would be cool to me. A retail/consumer goods company that clearly has the name and roots here. As much as Milwaukee Tool sounds great for the naming – I am pretty sure it is not going to be them. A friend who works for Milwaukee Tool told me they were not looking for continuing the naming rights beyond the sponsorship for construction. The clues hint at FIS Global. Think about it: Fortune 500 Company, huge global footprint, company with a large local point of presence in Milwaukee (3,000+ local employees) but HQ City (Jacksonville) doesn’t have an NBA Team.